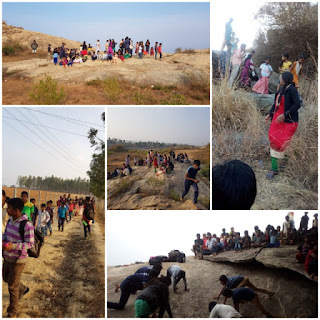 Today on 03/03/2019, Sunday 70 Participants from 6 different "Sanskara varga" went for an excursion to "Durga Betta" They started in the morning by 6:30. All the participants had a great time. A competition was held to present Sanskara Varga in which Kallubalu Sanskara Varga won the first prize.And they returned by 11 AM.